> stone box? Especially up there at the level of the KC? > originally designed in a V-shape. That damage is far too eratic to be the result of water erosion. Water drainage from KC would result in a straight V in line with the axis of the Antechamber portal. But that V is not aligned but rather has a sideways angle to it. The V is also not symmetrical but rather has different slopes to the east and west of the valley. Water would not carve such a sharp "V" but rather would have been more gradual - there is nothing there that would focus the water to that small segment where the V is. 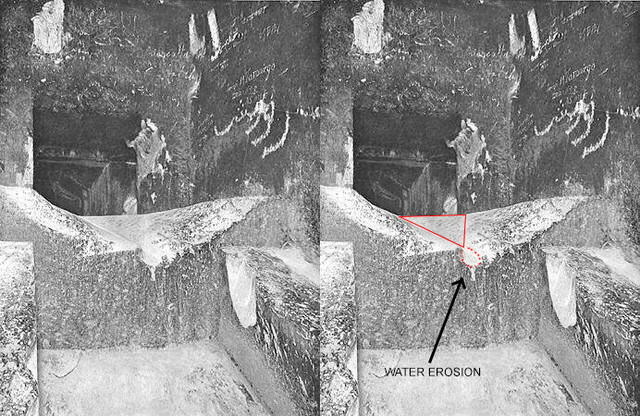 Also, for that much water to have passed across the Step to cause that kind of erosion in the Step, we also would see a trench at the bottom of the step representing the erosive force of the water as it pummeled the floor of the GG as it fell off the Step. The Great Step damage does not follow the pattern of liquid erosion at all. Likewise, the damage doesn't reflect a pattern supporting large tourist volume. Again, you would see a smoother broader pattern of damage and not a crooked central V. Also, it is far more likely that tourists used the side ramps to climb up to the Great Step rather than hoisting themselves up a full meter from the floor. The Edgars were very clear in pointing out how much easier it is to climb onto the Great Step from the side ramps instead of directly from the GG floor. 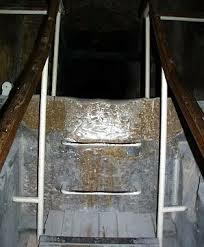 As seems to be the case with the stain under the KC shaft, the above photo appears to be the only photo of the Great Step before the repair was made. Depressing, isn't it? That they would call that a "restoration" which, first of all destroys an important historic surface that might have lent itself to the discovery of important data, while at the same time making the grandiose claim that they knew it was a simple squared off step without really knowing if something was there that had been chiseled away in ancient times. These Orwellian "restorations" only serve to destroy, not restore, irreplaceable historic evidence. And they have the nerve to decry drilling a 1cm hole in the wall at KV62 just to see if maybe, just maybe, we might find Nefertiti's tomb?! Ridiculous double standard. Edited 2 time(s). Last edit at 15-Aug-17 14:31 by Origyptian.